Rex knew the executive interviewing him picked up on his positive vibe ... yet, something was amiss in the executive's body language. Rex really needed this interview to pan out. Most job interviews are non-productive because studies show a strong correlation between how much the interviewer likes the interviewee and whether or not they get the job. In the end, most of the factual information that comes from the resume - the real stuff about the candidate that is a good indicator of performance - is forgotten. What is remembered is the impression the candidate made on the interviewer. Professor Frank Bernieri of the University of Toledo analyzed the performances of job applicants of various ages and backgrounds during 20-minute interviews in which the interviewers were asked to rate each candidate on attributes such as ambition, intelligence and competence. Then a group of observers was asked to watch video footage of just the first 15 seconds of each interview. The results showed that the observers' first impressions in 15 seconds almost paralleled the impressions of the interviewers. This study gives us further convincing evidence that you definitely don't get a second chance to make a first impression and that your approach, handshake and overall body language are the key factors in deciding the outcome. Research in the field of linguistics has shown a direct relationship between the amount of status, power or prestige a person commands, and their vocabulary range. The higher up the social or management ladder a person is, the better he is likely to be able to communicate in words and phrases. Body language research has revealed a correlation between a person's command of the spoken word and the number of gestures they use to communicate their message. The person at the top end of the status scale can use his range of vocabulary to communicate his meaning, whereas the less educated, less skilled lower-status person will rely more on gestures than words to communicate his message. He doesn't have the words so he substitutes gestures for words. As a general rule, the higher up the person is on the socio-economic scale, the less gesticulation and body movement they are likely to use. James Bond, Agent 007 in Her Majesty's Secret Service used these principles to great effect by having minimal body gestures, especially when under pressure. When being intimidated by the tough guys he remained relatively motionless and spoke in short, monotone sentences. High status people always 'keep their cool', which means revealing as little of their emotions as possible. Actors such as Jim Carrey are the opposite - they often play highly animated roles, emphasizing a lack of power; and usually plays powerless, intimidated men. Job seekers who don't get a call back after an interview often wonder where they went wrong. One factor, research shows, has a larger-than-expected impact on the outcome - the job seeker's ability, within the first few minutes of a meeting, to spark an elusive form of interpersonal chemistry called rapport. How do you forge a quick connection with a stranger? Bartenders, retail employees, stand-up comedians, and police investigators do it routinely, and researchers have studied their techniques. Their skills can be helpful in a job interview. On the verbal front, make the assessment: Is a hiring manager open to small talk and if that appears to be so start the conversation on a positive note. Retail and service-sector employees who perform well tend to pay close attention to customers and engage them in pleasant, upbeat conversations, research shows. Seek out any common interests or shared experiences to banter about. Simple examples; ask friendly questions about their favorite sports, if family pictures are on a desk ask about their family, ask how their commute was, or compliment the interviewer on their choice of watch, jewelry or clothing. Keep in mind that others form up to 90% of their opinion about you in the first four minutes. Research indicates repeatedly that the goodly majority of the impact you will make is via your non-verbal presentation. Remove any coat and leave it with a receptionist if possible. Avoid entering an office with your arms full, distracting from your presentation. Always stand in a reception area, never sit. Receptionists will insist you 'take a seat' because when you do, you're out of sight and they no longer have to deal with you. Stand and slowly rock back and forth on your feet which appears confident and in control. This body language is a constant reminder to a receptionist that you are still waiting. Your entry tells others how you expect to be treated. When the receptionist has given you the go ahead to enter, walk in without hesitation. Do not stand in the doorway, this suggests doubt or caution. When you walk through the door of the person's office, maintain the same speed. People who lack confidence often change up their pace in this context, perhaps entering the room with slight hesitation. Even if the person is on their landline or mobile phone or shuffling something on their desk, walk in directly and confidently with a smooth motion. Put down any laptop, mobile phone, briefcase, or whatever else may be in your hands, shake the person's hand and immediately take a seat. Let the other person see that you are accustomed to walking confidently into offices and that you don't expect to be kept waiting. People who walk slowly convey that they have plenty of time on their hands or are not interested in what they are doing. Influential people and those who want to command attention walk at a medium pace with medium length strides. Keep your palm straight and return the pressure you receive. Let the other person decide when to end the handshake. As circumstance permits step to the left of a rectangular desk as you approach to increase the odds of handshake between equals for those that are right-handed. Avoid handshakes directly across a desk. Use a person's name twice in the first 15 seconds and never talk for more than 30 seconds at a time. If you need sit in a low chair directly facing the other person, turn it away 45 degrees from the person to avoid being stuck in the 'reprimand' position. If you can't angle the chair, angle your body instead. If you're invited to sit in an informal area of the person's office, such as at an informal meeting table, this is a positive sign because a very large majority of business rejections are delivered from behind a desk. Avoid sitting on a low sofa that sinks so low it makes you look physically inconsequential - if necessary, sit upright on the edge so you can control your body language and gestures, and angle your body to 45 degrees away from the person. People who are calm and in control of their emotions use clear, uncomplicated, deliberate movements. High-status individuals use fewer gestures than low-status individuals. This is an ancient negotiating ploy - people with power don't have to move much. Mirror the other person's gestures and expressions as seems appropriate. Respect the other person's space, which will be largest in the opening minutes of the meeting. If you move too close too soon, the person may respond by sitting back, leaning away or using repetitive gestures. As a basic rule, you can move closer to familiar people but should be further back from those you have just met. Men generally move closer to women they work with while women generally move further back when they work with men. Work closer to those of similar age and further back from significantly older or younger ones. Pack your belongings calmly and deliberately, not too rushed, shake hands if possible, turn and walk out. If the door was closed when you entered, close it behind you as you leave. People always watch you from behind as you leave so, if you're a man, make sure you have shined the back of your shoes. This is an area many men neglect and women are critical of this. When a woman decides to leave she will point her foot towards the door and begin to adjust the back of her clothing and hair so that she makes a good rear-view impression as she departs. As mentioned earlier, hidden cameras show that, if you're a woman, others study your rear as you depart - whether you like it or not. When you get to the door turn around slowly and smile. It's far better that they recall your smiling face than your rear end. NO ONE wants to feel naked, lacking control in an interview for the job they crave, do they? If someone keeps you waiting for more than 20 minutes it shows either they're disorganized or it could be a form of power play. Keeping someone waiting is an effective way of reducing their status and enhancing the status of the person who is making them wait. This same effect can be seen when people are waiting in line at a restaurant or cinema - everyone assumes that the wait is going to be worthwhile, otherwise why would we all be waiting? Always have a mobile phone, laptop, or work documents visible to both make the best use of your time and demonstrate that you too are a busy professional. When the person who has kept you waiting comes out to meet you, lift your head slowly from your work and greet them, then pack up smoothly and confidently. The clear message you are sending is that you're a busy person that should not be inconvenienced by their disorganization. If the other person takes a phone call during the meeting or a third person enters and begins what seems like a long conversation, take out your mobile phone and engage in what would appear to be work-related activity ... without disturbing the other person(s). This gives them privacy and demonstrates that you don't waste your time. If you talk to your counterpart(s) using gestures signaling openness, does this mean you can tell grand stories about what you can accomplish and get away with it? Well...not necessarily, because if you use open positions when you know you're lying, your palms are likely to sweat, your cheeks may twitch and your pupils constrict. The most competent liars are those who can go into their acting role and act as if they actually believe the lie. A professional actor who can do this better than anyone else is presented with an Oscar. While we are not suggesting you tell lies, there is powerful evidence that if you practice the positive skills we've mentioned throughout this guide, they will become second nature to you and serve you well for the rest of your life. Scientists proved the 'fake it till you make it' concept using tests on birds. In many bird species, the more dominant a bird is, the darker its plumage will be. Darker colored birds are first in line for food and mates. Researchers took a number of lighter, weaker birds and dyed their plumage dark so that these birds would be 'lying' to the other birds that they were dominant. But the result was that the 'liar' birds were attacked by the real dominant birds because the 'liars' were still displaying weak and submissive body language. In the next tests the weaker birds, both male and female, were not only dyed but also injected with testosterone hormones to make them act dominantly. This time the 'liars' succeeded as they began strutting around acting in confident, superior ways, which completely fooled the real dominant birds. This demonstrates that you need to cast yourself into a believable role in an interview and mentally practice in advance how you will behave if you want others to take you seriously. Conduct short-term decision-making meetings standing up. Studies show that standing conversations are significantly shorter than sitting ones and the person who conducts a standing meeting is perceived as having higher status than those who sit. Standing whenever others enter your workspace is also an excellent timesaver. Standing decisions are quick and to the point and others tend to engage less in unproductive small talk. Research reveals that when our backs are towards an open space we become more stressed as our body readies itself in an evolutionary sense for possible attack from behind. This is an excellent position in which to place your opponents. People who keep their fingers closed when they talk with their hands and keep their hands below chin level, command the most attention. Using open fingers or having your hands held above the chin is perceived as less powerful. When you sit on a chair, keep your elbows out or on the arms of the chair. More submissive individuals keep their elbows in to protect themselves and are perceived as more timid. A University of California study showed that more persuasive words in spoken language are: discovery, guarantee, love, proven, results, save, easy, health, money, new, safety and you. Practice using these words interpersonally which should yield better results throughout all aspects of your life. A thin briefcase, laptop or tablet computer is carried typically by important people concerned with the bottom-line. Larger, fully packed briefcases are perceived as being carried by those doing the detailed work that while important may be of less consequence than that of an executive. In the time before going to an important interview or meeting, quiet yourself and mentally practice doing these things well. When you previsualize these actions they will come easily when the time is ripe, with others reacting accordingly. 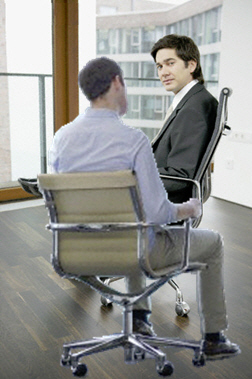 Have you ever been for a job interview and felt overwhelmed or helpless when you sat in the visitor's chair? Where the interviewer seemed so big and overwhelming and you felt small and insignificant? It is likely that the interviewer had cunningly arranged his office furnishings to raise his own status and power and, in so doing, lower yours. Certain strategies using chairs and seating arrangements can create this atmosphere in an office. There are three factors in raising perceived status and power using chairs: the size of the chair and its accessories, the height of the chair from the floor and the location of the chair relative to the other person. The height of the back of the chair raises or lowers a person's status. The higher the back of the chair, the more power and status the person sitting in it is perceived to have. Kings and others in high-power public positions may have the back of their throne or official chairs extended high vertically to make their status very explicit and obvious to all others. Comparably many senior executives have high-backed leather chairs while visitor's chairs in their offices have low backs. Swivel chairs have more power and status than fixed chairs, allowing the user freedom of movement when he is placed under pressure. Fixed chairs allow little or no movement and this lack of movement is compensated for by the sitter's use of body gestures that reveal their attitudes and feelings. Chairs with armrests, those that lean back and those that have wheels have more power. Status is perceived to have been gained if your chair is adjusted higher off the floor than another person's. Executives are known for sitting on high-backed chairs that are adjusted for maximum height while their visitors sit opposite on a low sofa or chair creating the perception of lesser power status. 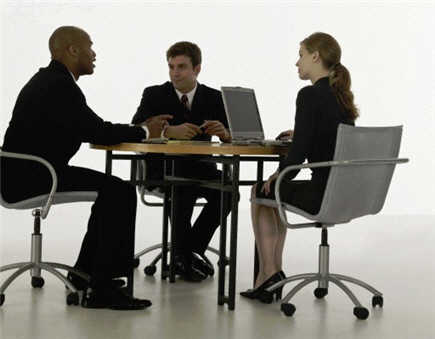 Most power is exerted on office visitors when their chairs are placed directly opposite in a competitive position. A power play is to place the visitor's chair as far away as possible from the executive's desk into a zone that would be defined as public territory, reducing the visitor's status. When two people sit directly opposite each other across a table, they unconsciously divide it into two equal territories. Each claims half as his own territory and will reject the other encroaching upon it. There will be occasions, however, when it may be difficult or inappropriate to take the corner position to present your case. Let's assume that you have a sample, or quotation displayed on a laptop, to present to another person who is sitting behind a rectangular desk and your objective is to get into the best position for presenting. First, place the article or laptop on the table and he will either lean forward and look at it, take it over to his side, or push it back into your territory. If he leans forward to look at it but does not pull it in or pick it up, you are compelled to deliver your presentation from where you sit because he does not want you on his side of the desk. If this happens, angle your body away at 45 degrees to him to present your case which is a softer less competitive position. If he takes it onto his side, however, this gives you the opportunity to ask permission to enter his territory and take either the corner or co-operative position. If, however, he pushes it back towards you, stay on your side. Never encroach on the other person's territory unless you have been given verbal or non-verbal permission to do so or you will put them offside. Take the following situation: you're a supervisor and are about to counsel a subordinate whose work performance is not up to expectations. You feel that you will need to use direct questions that require direct answers and this may put the subordinate under pressure. At times you will also need to show the subordinate compassion and, from time to time, that you agree with his thoughts or actions. Leaving aside interview and questioning techniques for these illustrations, consider the following points: (1) The counselling session will be in your office; (2) The subordinate will be seated on a chair with fixed legs and no arms, one that causes him to use body gestures and postures that will give you an understanding of his attitudes; and (3) You'll be sitting on a swivel chair that has arms, letting you eliminate some of your own gestures and allowing you to move around. There are three main angle positions you can use. As with the standing triangular position, sitting at 45 degrees gives an informal, relaxed attitude to the meeting and is a good opening position for a counselling session. You can show non-verbal agreement with the subordinate from this position by mirroring his movements and gestures. As in the open standing position, their bodies point to a third point to form a triangle, which can show agreement. 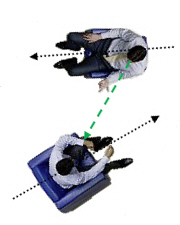 By turning your chair to point your body directly at someone you non-verbally tell them that you want direct answers to your direct questions. When you position your body 45 degrees away from the other person, you take the pressure off the interview. This is an excellent position from which to ask delicate or embarrassing questions, encouraging more open answers to your questions without them feeling as if they are being pressured. You should now be able to work out how to arrange an office to have as much power, influence or control as you want or to make it as relaxed, friendly and informal as you want. Here now is a case study showing how someone's office was hypothetically rearranged to help solve some of his personal manager/employee relationship problems. Aaron worked for a large financial services company. He had been promoted to a manager's position and given an office. After a few months in the role, Aaron found that the other employees disliked dealing with him and his relationship with them was often tense, particularly when they were in his office. He found it difficult to get them to follow his instructions and had heard they were talking about him behind his back. Observations of Aaron's dilemma suggested that the communication breakdowns were at their worst when the employees were in his office. The visitor's chair was placed in the competitive position in relation to Aaron. Aaron's desk had a solid front that hid his lower body and prevented the subordinates observing his lower gestures to evaluate how he felt. Aaron often sat using power-oriented body language whenever a subordinate was in his office. Aaron had a swivel chair with a high back, armrests and wheels. The visitor's chair was a plain low-backed chair with fixed legs and no armrests. The back of the chair was oriented toward the open door -- intelligence agents instinctively know this is a low power orientation fraught with danger. The walls of the office were solid except for a couple of windows and a clear glass partition. Aaron had instinctively placed his desk in a corner with his back against the wall, sending subtle signals about reduced accessibility through greater physical distance between himself and his subordinates. Aaron's desk was placed in front of a glass partition and windows, making his office appear bigger and allowing him to be visible before visitors entered his office. His desk was replaced with one having a large rounded corner where two could comfortably sit in non-competitive positions. A round table with swivel chairs were placed near the middle of the office where a small group of people could sit for informal meetings in non-competitive positions. A revised office layout incorporating several elements to reduce the feeling of emotional distance and hierarchy. A sectional sofa was placed in the corner of the office to further promote teamwork and create a friendlier atmosphere. Green plants were added in a couple spots in the office to lessen any austere feel in the room. Aaron practiced sitting in open positions, consciously using his palms whenever he spoke with others. In the revised office layout one important element was the addition of a round meeting table, creating a greater sense of interpersonal equality. The results? Significantly improved manager/staff relationships and some staff began describing Aaron as 'easygoing' and as a relaxed person to work with. All that is needed to raise your status, and increase your power and effectiveness with others, is a little thought given to non-verbal gymnastics in your office or home. Unfortunately, most executive offices are arranged as Aaron's was initially set out, because offices are designed by office designers, not by those who understand interaction between people. Rarely is consideration given to the negative non-verbal signals that can be unwittingly communicated to others. Study your own workplace layout and use the preceding information to make the positive changes needed. The thing about power plays and office politics is that you can anticipate them and even plan your own in advance. 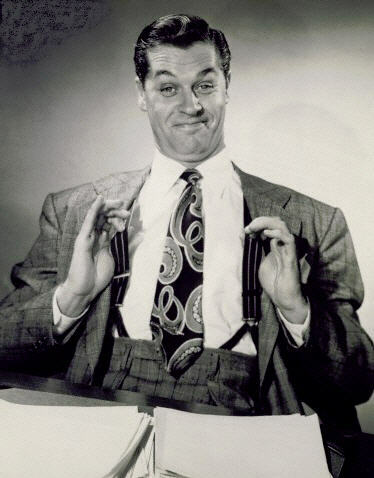 Rex, as noted earlier, did not have the sensitivity to understand that while OK in some businesses with conservative cultures, suspenders are not a fashion forward statement, nor are ties mismatched with a business suit. Poor choices in attire for such a critical meeting could be reflected, an interviewing executive might think, in less than keen judgement in other important business matters with associates and customers.